Raquel Panitz/Staff Photographer During his time at Binghamton, goalie Robert Moewes earned America East Goalkeeper of the Year honors for two straight seasons. 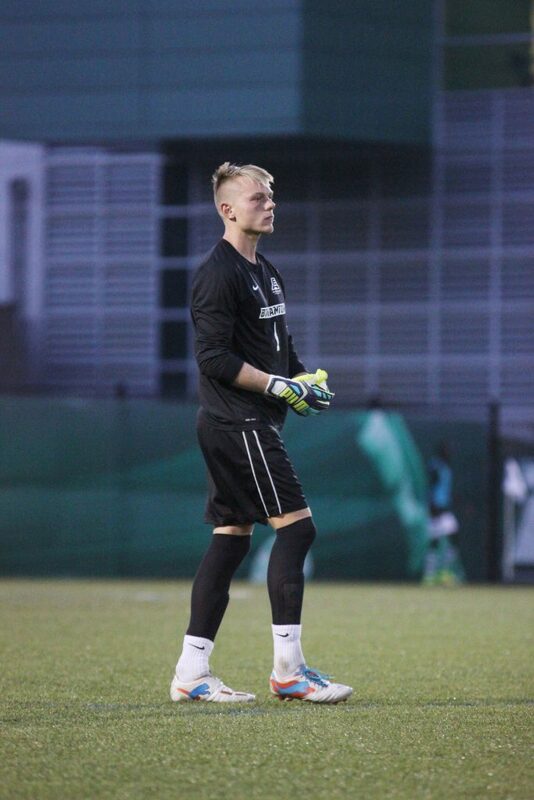 Last month, former Binghamton goalkeeper Robert Moewes was selected by Toronto FC in the third round of the MLS SuperDraft after spending a year playing at Duke. We spoke with Moewes on Wednesday. Pipe Dream edited this interview for clarity. Pipe Dream: How was your experience at Duke different than playing at Binghamton? Robert Moewes: I think in general the competition in the Atlantic Coast Conference is a higher level. The facilities and grass fields are all insane. But as a goalkeeper, you’ve got to play ball anyway. The game is a little faster, but it’s not that different to me. PD: What was the whole MLS SuperDraft process like for you — going through the Combine and waiting for the first two rounds to get drafted? RM: The Combine was a great experience, and the level at the Combine was really good. It was a really great event. I’m really grateful to have had this experience. For an international goalkeeper, it can be a lot harder to get drafted than players from North America. PD: Is there anything that you’re looking forward to most as you transition from playing college soccer to the MLS? RM: Right now, I still have to earn a contract with Toronto FC. But it would definitely be great to be able to be completely focused entirely on soccer. Being in school is great, but you always have to hurry up on the practice field; you don’t have that much time. PD: What is your status with Toronto FC right now? RM: When you get drafted, you go into preseason with the team, which is what I’m doing right now while I’m still in school. So it’s a little bit stressful right now as I’m trying to finish my degree. I was in Los Angeles last week with Toronto and I was practicing for the two weeks before that. PD: When I talked to BU head coach Paul Marco a few weeks ago, he was a little disappointed that you didn’t go higher in the draft. He believes that you’re one of the best college goalkeepers in the country. Do you feel a similar way, that you should’ve gone a little higher? RM: Yeah, I think so. To be honest, I think so. There were five goalkeepers ahead of me, and I don’t think I’m the worst in that group. The fact that I’m an international goalkeeper played a big role; some teams are not willing to sacrifice an international spot for a new and young goalkeeper, especially knowing that a new goalkeeper will not start right away. PD: You’re trying to finish your master’s in management studies from Duke at the same time as you’re training with Toronto FC. Can you explain how you’re doing it? RM: Luckily, both Duke and Toronto FC are cooperating with me. Right now, I have missed about two weeks worth of classes, but I can’t miss much more. So I’ve been flying back and forth, and luckily, Toronto FC has helped me out there. I’ll have a spring break coming up, so I’ll have three weeks where I can just focus on being in Toronto before there’s another period of six weeks where I will have to do the same thing. PD: Being from Germany, if you were given the opportunity to play professionally in Europe, would you take it? RM: I think it’s not realistic. I have the most leverage in the United States, where people have seen me play. But it’s every kid’s dream to play in Europe. PD: Is there a goalkeeper that you would say that you’ve grown up watching, and have modeled your game after? RM: The best goalkeeper right now is obviously Manuel Neuer. I look at his game and try to play like him, but obviously a much different level of skill.